Oranjestad- After a long period of many preparations and the approval in the Island Council of the Island Ordinance Waste Materials (Eilandsverordening Afvalstoffen) in June 2016, garbage collection and processing of garbage is entering a whole new phase on Sint Eustatius. The road towards the new and much more professional garbage collection and processing has been a lengthy and not always easy one. 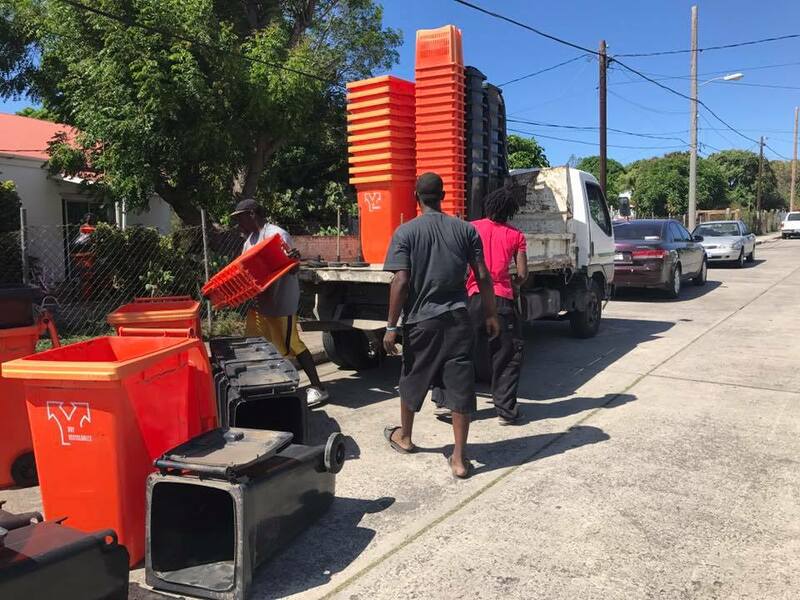 Last week a start was made with the distribution of the bins which will be used in the collection of garbage in households and businesses on the island. The collection was only part of the challenge, which for sure was in dire need of improvement. Until now the garbage was mostly dumped on the landfill, with a lot of negative consequences for the island. However, in the new situation there will be not only more professional collection, but also a professional processing of garbage at a completely new plant. Although the coalition government of PLP and independent council member Reuben Merkman is often criticized for being ineffective and for ‘getting nothing done’, it cannot be denied that concrete progress is being made with issues which have plagued the island for decades and decades.